What you can learn from the icons of yesterday and today. 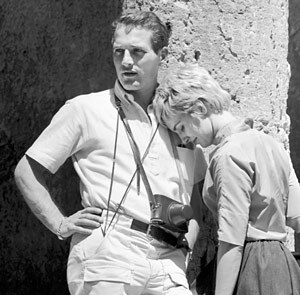 Paul Newman was one of those rare fellows who excelled at everything he did. He was a WWII soldier who became an actor, then a director, then a race car driver and later a philanthropist. It's that sort of talent and charisma that continues to draw people to him naturally. But it certainly didn't hurt that the guy was a sharp dresser. Newman's Own, his food company which donates all proceeds to charity, has raised more than $300 million for various causes. He knew what worked for him and he wore it in his own way. And while he was always impeccably dressed for black tie affairs, he looked best in his off-duty attire which was always classic, comfortable and masculine. Newman was no stranger to a well worn pair of jeans or five pocket corduroys and had a penchant for V-neck sweaters and oxford cloth button-downs. When it came to shoes, he often went with penny loafers, canvas sneakers or sturdy brown boots. He kept his hair cropped close, but it was usually messy enough to let his natural curl come out. It's all endemic of his personal style: things don't have to be pristine and perfect to look good. Stick with the classics. Harrington jackets, desert boots and oxford cloth popovers look just as good today as they did back then. Details make the man. 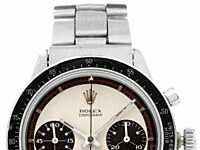 Newman often sported simple aviator sunglasses and a Rolex Daytona. What more do you need? Don't fight time. Guys get better looking with age. A few wrinkles and some grey hair can add to a man's rugged appeal.